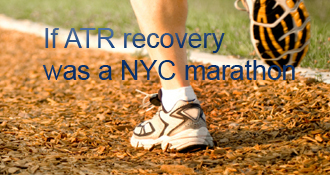 wacaine has completed the grueling 26.2 ATR miles to full recovery! My strength continues to increase. Flexibility so so but in proving. The PT tendonitis subsiding a little. Question though. I have for the most part since trying to start walking had pain in my heel at the insertion point of my achilles. There is a visible bump there. I do not know for how long I have had this bump on my heel but that is definitely the isolation of where the pain is. And I know for sure it hurt at week 16 when looking at my past posts. The bump is a little spongy and then hard after that. I can’t tell where the spongy stops and bone starts. I don’t remember it being like that before. The scar runs next to it so not sure if the spongy part is scar tissue or not. I did some internet searching and it comes back with all sorts of possibilities among them a heel spur which it looks like lots of people have surgically removed. I HOPE THAT IS NOT IT! I don’t want to have to go through this again. I see my doctor in a few weeks and I will ask him then. In the mean time has anyone else have this bump? I have developed some tendonitis/tendonosis on what my Posterior Tibial tendon. My PT and doctor did not seem too concerned and were not too shocked either. They gave me PPT Langer Shoe Insoles for my shoes and said keep going in the non-pain range. Easier said than done. When you think you are on the path to recovering you get a a curve ball like this. Only silver lining I can find in this storm cloud is it limits me slightly from pushing on too fast but I hope it does not stick around too long. Other than that I am a far ways off from pre injury BUT my strength and flexibility is slowly but surely returning. I can walk pretty much normal now in shoes. Bear foot is rough with the tendonitis. My jogging is pretty pathetic still largely because my strength and dorsiflection is still pretty bad. Many people posting here seem to have gained most of their DF back by 20 weeks. I stretch daily but would say my DF is still 20 degrees off from my good leg. I really hope it continues to return otherwise I don’t think I could ever run again. The restriction seems to be largely my soleus muscle which kind of makes sense since that is near my rupture. When I hang off stairs my feet match so my calf is fine. The second I bend my knee to do DF then I get the restriction. So this week I have been able to consistently get my knee to touch the wall when doing DF. I am also gaining great progress in dual heal raises to where they are pretty easy except for that last bit to get on my very tip toes. I contribute that to going to the pool 2 times a week and doing my therapy in the water where I can burn out my calf muscles more easily without putting too much strain on my achilles. Progress, woot! I am now turning to another concern which I have noticed. When walking I get a pain in what feels like the bone of my ankle where my achilles attaches. It is not a constant pain but comes and goes randomly with different levels of walking. Sometimes pretty painful other times just letting me know it is there. What I find odd is it occurs more when not engaging my calf muscles. If I limp around it hurts more than if I force my calf to engage. Also, this area is always warm to the touch and can get swollen. I figured that would have gone away by now. Any one else experience this? Another is I have a lump half the size of a golf ball right above where my tendon attaches to the ankle bone. It does not hurt but right below it does where the bone is. I do not remember if it was there before or not. It probably was but was less of a concern early on and I just assumed it would go away. 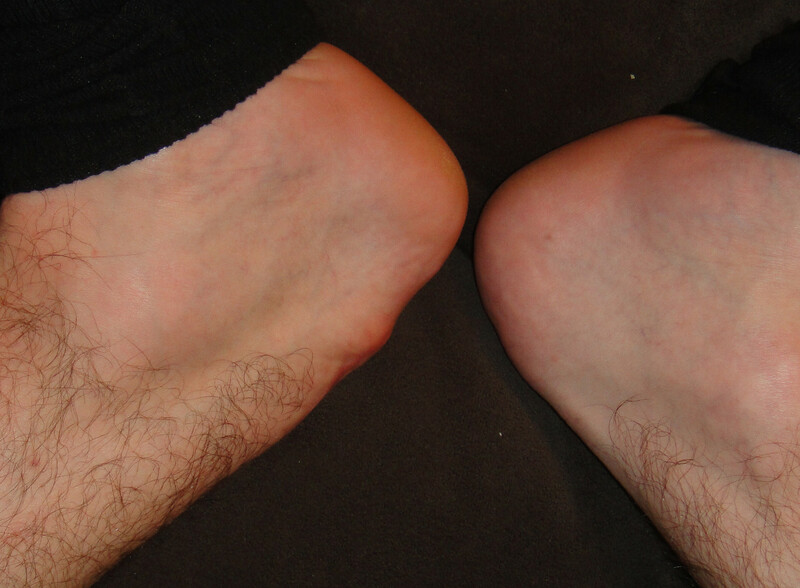 Anyways, compared to my other ankle which is smooth and not lumpy it concerns me. I am worried it could cause the tendon not to slide as well or something? For anyone who has gone through this, do you still have lumps at 6 months or a year out? I posted last time that I was concerned about my DF. The gage I am using is put my toes against the wall and bend my knee. I then measure the distance from my knee to the wall. It was at 8 cm from the wall two weeks ago. With daily rehab plus some stretching where I go until I feel a little pain has gotten me some good return. Below is the progress I am seeing by daily measurements. It is slow but surly getting better. I asked my surgeon who agrees with my PT that as long as I continue to stretch I will be able to gain all my DF back (not quickly but over a few months). He went on to explain that the lengthening/stretching that is occurring is in the muscle, not the repair. The repair should not stretch/lengthen, tendons should NEVER do that. I also have a pre planned trip to a water park (made before my injury) coming up in a month which I am super excited and at the same time little sad about what I will be able to do. I asked both my PT and surgeon about how safe it is to do the rides and such which they both gave me caution on. The lazy river and wave pool should be no problem. As for the tube rides, as long as I can avoid jamming my foot against a wall or landing on my foot to cause forced DF I should be fine. Why I am sad is the water park has a flow rider which simulates a wave which you can do body boarding or surfing on. Last year, while surfing, I was able to work my way up to staying on a whole minute before falling and want to see if I still had it this year. The surfing ride is probably the biggest risk of me falling and re-injuring my foot since I will be in the least control when falling off. The part of me that really wants to do it is thinking back on all the times I fell last year, each time it is into a rushing stream of water where you really have no change to plant your feet. Its more your body hits the water and it pushes you back onto a platform where you make sure your swim trunks didn’t get ripped off and you get back to your feet there. We will see where I am in a month but I probably will not risk that ride to my great disappointment. I have been working my way to two shoes slowly. I wear two shoes for short distance walking and the boot for the longer distance at the moment. I can still get pains in my leg when walking if I try to walk too fast still and I cannot walk very well at all without wedges in my shoe. My ROM has gotten better but am a little concerned about my dorsiflexion. While my planterflection is 90% back compared to my good leg the dorsiflexion has a very far way to go. By last measurement, my dorsiflexion is only at 3 degrees past neutral and really giving me trouble getting a natural gate when walking without wedges in my shoe. For a comparison of how much different they are I do this rough measurement: Facing the wall, touch my toes to the wall and bend my knees. I can touch the wall no problem with good leg knee while my bad leg is 3.5 inches away. How long does that take to come back? I do not expected it to come 100% back but even 75% would be nice. Still trucking alone. Went to my father in law’s retirement party this past Friday. Had a lot of fun and I was on my feet for maybe 4-5 hours. This has been the longest I have been on my feet since the injury. Everything felt fine BUT my ankle was huge when I got home. Put it on ice and slept on the couch so I could elevate my foot against the back so my foot was way above my heart all night. Returned to normal in the morning. The other thing I have been dealing with is the bottom of my foot, my “heal pad” has been hurting when putting full weight on it just standing or limping around the house. Has anyone else had the swelling and/or foot hurting and how long did it take for those issues to go away? I have been having very isolated a 1 out of 10 scale of throbbing / aching on one side of my achilles. Not painful but noticeable and was concerning me. It started maybe three weeks ago and became more noticeable once I began weight bearing. It would do it a random times of day resting the leg or moving it. The feeling has dropped off in the last week or so. I thought it weird that it was not uniform since I ripped it all the way through the tendon. You would think the feeling would go all the way across the tendon and not be isolated to a single side. 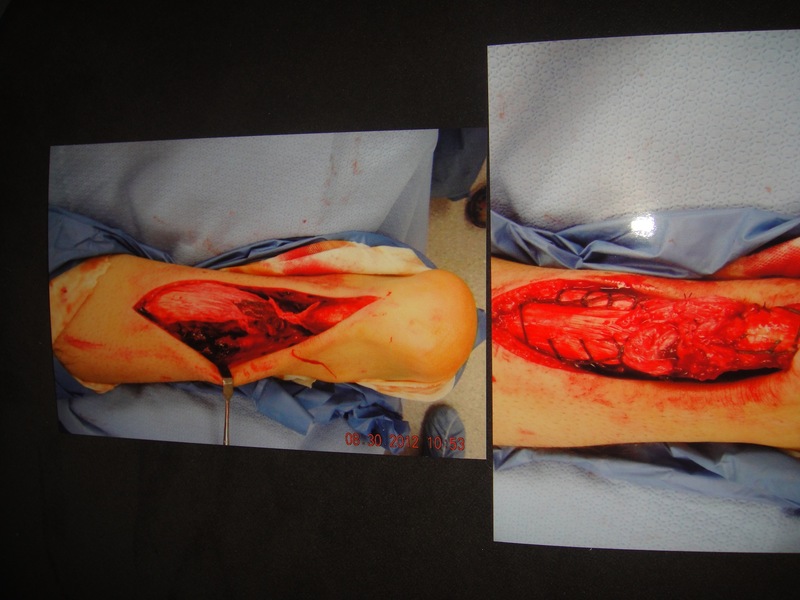 The continuity of the tendon from the heal up towards the calf muscle. It it was loose of mushy that would be a sign of rupture. Is my food resting in a good position. A ruptured tendon will leave your foot floppy. I asked him about the Thompsons test which he explained is pretty inconclusive this early post op as the foot is resting where the test ends. He did how ever show if me if I relax my foot, press my foot more towards neutral with one hand and squeezed your calf you can feel the movement that way (not easy to balance and achieve by yourself though). I am FWB now which is is awesome with the drawback of really throwing my knees / hits / back well just about everything out of alignment with the bulking 2 inches taller boot. Progress I guess. My ROM has improved to just about 0 degrees on a good day. Now it is time to buckle down on the rehab. These past two weeks have I resumed ROM and worked my way down to 2 heel lifts (starting from 3). I think I could move to 1 lift but it would be a tight fit dont want to push it too fast. I have been going to the park and sitting by the creek. It is no mountain biking but it is better than nothing. Speaking of that I have read some people start biking again around 5 weeks That is crazy and I am jealous! I am going to ask they feel its safe enough to do that next time I go to the doctor. I had my first PT visit. My PT doctor massaged my leg and gave me some stretches and workouts to keep the muscles I still have. While at my PT session it was explained to me the concept of adhesions. Which I now understand and have. It is basically when you get cut through multiple layers of “stuff” like skin, muscle, tendon it will heal together as one. The massaging and ROM help break that up. I now notice when I move my ankle/tendon my whole skin moves with it. This does not happen on my good leg. I have noticed a dent in my incision has flattened out which I assume is the adhesions on either side breaking apart. I have also had a mild burning sensation in the surgery area once and a while. Not sure what that is about. Until I am weight bearing my PT said there is really nothing more she could do that I could not do my self until I start weight bearing. In some better news my PT doctor mentioned my surgeon has noted in my chart possibly starting weight bearing next visit to him. I go to the doctor next wednesday and I dont want to get my hopes up but I would really like to ditch the crutches. This is my first post so I need to give the back story. My future updates should be much smaller. I fully ruptured my left achilles tendon 8/26/2012 playing backyard kickball of all things. During the game leading up to this I started to notice my lower left calf/ankle feeling sore. That should have been the sign to stop but I have been active all my life and what is a little soreness. Being left footed I figured it was partly from kicking a heavy rubber ball over and over. It was maybe two hours into playing, I kicked the ball, planted my left foot to run, just as I did the entire game. As I pushed off my foot I felt ripping in my calf area. I had no pain but my foot was not working right. I could not push off my foot. I was pretty calm up until the point I pinched the area of where I you normally feel the “hard cord rubber thing” behind the ankle and all I felt was mush. I knew I did something major at this point. It was confirmed at the ER that day I ruptured my achilles and I had surgery to repair it 8/30/2012. In hind sight, aside from obviously stopping at a sore leg before I ruptured my achilles, I should have skipped the ER as it was a hefty bill to put me into a splint and tell me I need to go to another doctor. Live and learn I guess. Week 1 post op was not soo bad. Just kept taking my Percocet which made me sleep most of of the week. Week 2 was a little better. Started to get a little better at the cruches. Leg throbbing when it was below my heart started to go away. Week 3 got my stitches out and put into a boot. YAY. Was told could do some limited ROM. All was going great, I was just put into a boot and started ROM. Sept 29th, around 4 weeks post op, and then I slipped on the stairs. To prevent falling I put full weight on my bad leg. As the weight came down I felt tingling in my foot and as I came to a stop it shocklingy felt pretty good. It was my first time on my leg in 4 weeks and nothing hurt. This was immediately followed by the feeling of something in the area of the tendon letting go. It did not hurt but was just a small release of some kind. I kinda wish it hurt a little so I could know if all was ok or not. I did a self exam and it looked OK but that feeling I had could not have been good. Went to the doctor four days later who did a physical exam. He said what ever it was I felt, my tendon still appears to be attached. It is possible for a small tear to exist but felt it less likely. He mentioned I have permanent stitches (which with the pictures I have look very well sewn in there) and it would be very difficult to re-rupture with them. He followed that up with a however, anything is possible with the right amount of force. The doctor said an MRI is not an option at this point as it will be inconclusive with too much mix of healing tendon + possible damaged tendon. In feeling no gap in my tendon and still noticing my concern he gave me four options in ranking falling somewhere between super conservative to more extreme. Do exploratory surgery to see if anything is wrong, go back in a cast for 2-3 weeks, rest it for a week including no ROM, continue as normal. I chose the middle ground to rest for a week and take it from there. Two things that still worry me is 1) What was it I felt that let go? and 2) My calf muscle has begun to ache (maybe throb a little) when I first stand up after a long time of sitting or sleeping. The longer I am not standing the more it hurts when I do. It goes away after a few minutes. The doctor said this is normal but what concerns me is it was not doing that until after I fell. He guessed it might be a side affect from when I slipped causing my tendon to pull at my calf which has been unused for soo long. He could not know for sure unless we did the exploratory surgery which I opted against. I am ~1 year 4 months since I ruptured and the bump is still there. It does not hurt much if at all anymore which is good. I think I was over doing the stretching. I pretty much stopped my therapy for about a month because I was getting defeated with the pains and such. I continued to live my life, walk and bike etc. but stopped trying to increase my range of motion by stretching or doing heel raises. I think that did it because the pain in the heel went away, the bump did not though. This was around ~9 months. I keep saying I will follow up with the doctor for an x-ray to see what it is but as long as it is not hurting I have no urgency. Only issues I have with it now is I get a blister when I wear certain dress shoes. I hope you are doing well! I am currently about 6 months post-surgery, and my state of affairs is almost exactly like yours was when you made this post (pain and bump in same area). I was wondering how everything turned out, how you resolved the pain issue, what it was, etc. Let me know if you ever catch a free moment! Philip, if you are still around and could chime in, id be curious as to how to progressed and what you did as well! My DF seems to be relatively good. Now at 23 weeks I can get to 9cm, but with the caveat that that is only after two previous stretches - on the first stretch I will be at about 6cm, then 7.5cm, then 9cm. It hurts though, especially at the end of the stretch as the tension is released. The real limiting factor seems to be the PT - the main tightness is very much on the inside of my ankle. My good leg has good flexibility - c 13cm. At the physio yesterday I got strapped into a biodex machine to test the relative strength of my ankles for the first time. The bad ankle is at roughly 50% of the good one (although my good one is relatively strong as a result of doing a lot of cycling the past 5 years). My physio seemed a bit disappointed with that as I think he’d wanted to be able to say I could start thinking about running soon, but to be fair I’m only just back on my bike (which is my main sport) so I’m happy I can now push on and really concentrate on a combination of heel raises and ever longer cycle rides. Thanks Philip for the post! I too have a very hard lower calf along the scar line. The skin used to be tightly adhered to it as one solid piece which has loosened tremendously by is still attached to the below muscle/tendon below. Just curious what is the range of your DF right now? Mine at 22 weeks was toe moved 4 cm off the wall and could still touch wall (vs my good leg of ~12 cm of wall). I have been logging my progress of DF stretch since the beginning. I am gaining just under 1 cm a week (I am most likely pushing it a little too hard which either gave or at the least is not helping the PT tendonitis and bump pain I am having). At this point I can now move my toe away from the wall ~7cm and touch the wall. Also, what I think has been helping me I think is my bi-weekly visit to the pool and sit in the hot tub for ~20 minutes. Putting my ankle near one of the jets also feels awesome. It looks like you recovery progress is very similar to mine. I suffered a full rupture playing field hockey on astroturf at the end of September (so, 3 or 4 weeks after you did yours?). Treated conservatively in a cast for 5 weeks, then partial weight bearing in an airboot for 5 weeks with physiotherapy once a week. I’m now 22 weeks post injury and have been going to the gym regularly for 8 weeks. Strength is gradually returning to the calf but, like you, I’ve had inflammation of the Posterior Tibial tendon and have a lump on the tendon in much the same place as you. The other noticeable issue is a build-up of firm tissue towards the bottom of the calf - I don’t know if this is calf muscle or scar tissue. Do you have something similar as well? In terms of recovery, my flexibility is gradually improving with some aggressive, full body-weight stretching - this is really uncomfortable, but I’m starting to see the benefit and can touch the wall with my knee. Pain from the tendon lump during exercise is easing now, so hopefully that is improving. I didn’t pay much attention to bumps, but when I overdid (1-leg heel raises as soon as I could walk without a limp), I developed a pain that seemed to come right from there (back of the heel), that lasted a month. My cure was to back off the exertion, and go back into a hinged boot until the pain went away, a month later. No pain there since, and no bump that I notice, anyway. I know some people have had bony spurs removed from the back of their heels (some with AT removed and reattached, some not), but I don’t THINK that’s what “heel spur” usually means. I don’t think so. . .
Bummer, Wacaine, hope it improves for you. That issue of the healed AT lengths, not length — i.e., the sometimes different lengths to the two different muscles — doesn’t seem to get much attention, even when we’re discussing “healing long” and “healing short”. My AT-soleus also seems shorter than my AT-Gastroc, but in my case I prefer the AT-soleus length. Details are on my blog. I hadn’t exactly left my boot yet. Hinged boot, SLOW rehab, I realized that I was walking normally in the hinged boot, and had just taken my first normal no-dip steps at home that morning. When my young PT (University sports-med clinic, tho I was ~55) saw me walk, she paraded me barefoot around the whole (large!) clinic! Then we went back to her table and did more work, mostly exercises. She told me to do 1-leg heel raises. I told her it was too soon, because no way could I do 8 of ‘em — my resistance-training rule of thumb. She said “Just do as many as you can,” a sentence that should NEVER leave a PT’s lips, IMHO! I did maybe 3 or 4, grunting and sweating. TWO dummies! The pain started a few hours later. It was way worse than the ATR pain, tho the post-op pain was pretty bad. It was obviously from overuse, so coming out of the boot seemed wrong. It was exactly a month, in the hinged boot, before I could stride normally again without that pain at the back of the heel. Question about your set back. Did you go into the boot because it was that painful or could you still walk with it? Mine for the most part is bearable, kinda like a bruise. As for my heel pain I figured it might be from overuse. It is just soo hard to not do stuff now that I am starting to be able to. I am going to lay off my leg for a few days and see if the pain lessens. I have mentioned to my OS and PT that my heel hurts. It has been hurting since I could bear weight and they said a little bit is OK and expected, a lot is not. Pain is relative so it is kinda hard to know when I am reaching where it should not be. Seeing a PT? Still doing any follow-up with your OS? Either one might have a smart opinion about the lump, and maybe the discomfort/pain, too. The bottom of the AT attaches to the back of the heel (”calcaneus”?) bone. (Pulling up on that spot rotates the ankle joint, toes down.) Based on my own 2-ATR experience, I think that pain there is NOT generally something to be worked through or ignored in a “no pain no gain” way, but a sign that you’re overdoing. Not a statistically significant sample, but that’s where my leg hurt (a LOT) after I over-did heel raises after ATR #1, and set myself back a MONTH (back in the hinged boot!) until that pain subsided. Otherwise, 15-16 weeks was still very early times for lots of us, when it comes to walking perfectly, “losing” the swelling, and expecting your two legs to look identical. There’s a time to stretch and regain DF ROM, and you’re probably pretty close. Nobody really knows when the window for “healing long” ends, but the window for re-rupturing starts closing around where you are now (~12 weeks post-whatever). At 12 weeks, I was right about where you are in dorsiflexion, and planterflexion was near 100%. I actually didn’t do any active stretching until my 12th week, as I was more worried about healing long than I was about regaining my ROM. My thinking was that I would rather get my ROM a little later, than to heal long. So my only form of stretching up until that point was to just shuffle around my house. It was enough to loosen up the adhesion that stiffened up my ankle. After 12 weeks, I began to actively stretch. I would stretch just enough to feel a little pain, but nothing past that. Every day just a little bit more. I was super careful not to push hard. For the wall test, it took me about 20 days to finally be able to touch my knee to the wall. I probably could have done it in about 2 weeks, but I was aiming more to stretch out the adhesion instead of stretching the tendon. I put such little pressure on the stretching that the entire process was pretty much painless. My blog remembers my answers better than I, alas! My swelling lasted way longer than I preferred, and I started a page just about that! The foot hurting thing faded steadily, but took a while to vanish completely. Like maybe 3 months in, if I stepped barefoot on a thin phone cord or walked onto concrete, I still “noticed”. Crocs felt great, and I still wear a pair around the house! +1 to what Starshep said!! I used a “cast shoe” — a strap-on Velcro “sandal”, designed to add a sole to a walking cast. But I strapped it to a sandal, and wore that assembly on my “other” foot, opposite the booted foot, while walking around the house. It made me level, so my knees and hips survived. For outside, I added multiple footbeds inside my tallest hiking boot, and I was very close to level. DO NOT train your body to walk out of balance! Even if you avoid injury, you’ll probably mess up your natural gait, just as you’re starting to try to remember how it goes! You will need to find a way to level your good foot with your foot that is in the boot. Having the 2 feet at different levels will put a lot of strain on your body. I was able to do it by shoving a pair of folded up athletic socks into the heel area of my shoe. There are also commercially available heel lifts and you could also get custom made ones at a shoemaker. Or perhaps your doctor has some ideas. Hi , I certainly felt a certain discomfort inside left of my ruptured ankle and still feel a tightness more on this side when doing certain exercises . I can only speak for my own injury , but my PT explained that when healing you get adhesions forming . In other words scar tissues also connects to the surrounding tissues . Now I am in two shoes my PT massages the thickened area to remodel and help reduce these adhesions . I believe through time these reduce and the tendon gets leaner . My surgeon gave them to my wife in the waiting room without me ever asking for them. I didn’t even think that was an option. I am glad he gave them and I will ask ever surgeon for photos if I ever need another surgery (I hope never again though). I think part of the reason he gave the pictures is he has a good sense of humor and right before I went into surgery I asked him “Do I really need this, I can still point my toes?”. His first words to my wife when he handed the photos over was “Your husband didn’t think he needed surgery”. ALSO, I am pretty sure most surgeons take photos of all surgeries for their “resume” of what they have done AND for insurance purposes OR to at least protect themselves should they get sued. Great pictures. How did you get those? Good luck. I can’t wait to be fwb. I am glad to be pwb now. I still have my stitches in and worry that I will reinjure it every step I take. Not sure why. Ill ask if he does not give me weight bearing when I see him this Wednesday. Only 2 things I can think of is my scare on the fourth week where I put a ton of weight on it and felt something let go OR my rupture was higher than normal meaning I ripped through some muscle and then my whole tendon. He mentioned he was not worried too much about the tendon holding but the muscle he had to stitch back on which is softer than the tendon he was not sure would hold as well if starting putting a lot of strain on it. We will see this Wednesday. Any clues why your Doc is keeping you NWB so long? You’ve had your ATR repaired surgically, and you’re staying off that foot way longer than many of us who skipped the surgery (and those who skipped the surgery in the UWO study, too). There are several links on the main page (look for “studies” or “protocols”) that found no benefit (or worse) from delaying PWB and FWB. Pushing too fast to neutral (0 heel wedges) can be scary, though the UWO folks took that step at 6 weeks with or without surgery. But they also went to PWB at 2 weeks and FWB at 4. There’s no reason to wait for neutral position to start Weight Bearing, though some people (and maybe some Docs) confuse the two. I don’t envy you but I reckon you’ll be OK. At least the squeeze test is the same before and after. Hope it is good news. I asked my doctor about the Thompsons test and I was actually trying the Thompsons test before I fell. I failed before I fell and failed afterwards. The doctor said that was because my ankle is resting at where the Thompsons test would end. My ankle is still pretty stiff and pointing maybe 75 degrees down still which makes sense. I most definitely hope it is not a re-rupture. I do loose sleep still thinking about that moment and every possible thing I could have maybe done to avoid putting my foot down. Like just taking the fall which did flash through my head a split second but I was half way up the stairs and that is a ways to fall. Most other damage would have been worth it probably should I trade that for a re-ruptured. Or I could have broke my good leg and been completely immobile. Who knows now. I re ruptured at 14 weeks and felt it snap and heard a pop. At your stage of recovery you wouldn’t neccesarily hear a pop. Hopefully you haven’t re ruptured. The reason I’m replying to you though is because after my re rupture the most painful part of my leg was my calf. It felt as though I had been booted by a donkey it was that sore. I know you’re not so bad. I would push for an MRI as soon as it would give you a good result. I knew mine had gone again but a new doc I saw as mine was on leave wasn’t sure and an MRI did confirm for me. I was non op though and your stitches sound very strong. Time will tell but an MRI, will confirm. A question though, are you passing the Thompson/Simmonds test. Seems to me that mechanically that is the most sound way of telling if you’re still intact. I failed it on my re rupture. A number of posters here have reported ripping sensations that were not reruptures, and they often experienced better ankle “performance” soon afterwards, and interpreted the experience as a break-up of scar tissue, including attachments (binding of adjacent layers — layers that should slide past each other — by scar tissue). That may be what you experienced. Alternatively, a slip on stairs can easily cause a minor injury (muscle pull, strain, sprain, etc.) to a healthy, fit, and strong ankle, and an ankle that’s been left to atrophy for a month is probably more prone to any and all of them. Legs aren’t simple. I’d stay the course with your plan, and I’d expect (and hope!) that the rest and time and near-magical healing will solve the problem. wacaine’s AchillesBlog is proudly powered by WordPress and WPDesigner..